These are truly strange times we all live in. Last week Aberfeldy were playing in Mexico to 7,000 people in a country where their record isn’t even out. 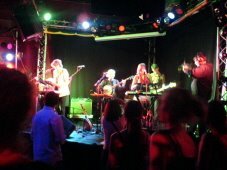 Meanwhile, back in the UK, at Edinburgh’s Bongo Club (admittedly a place with a much smaller capacity) the crowd are much smaller, but they are doing a hastily arranged gig for Oxjam, and they are back on home turf… it’s great to see them back here. Just to put it in some kind of context, I have now seen Aberfeldy seven times. So, yes, I came to praise Aberfeldy, and dragging my friends along with me (my girlfriend, sam, who provided the photo at the top has seen them a mere three times. But I digress). And as I mentioned before, they have just grown so much. The band have become so tight on stage, and just look so goddamn cool. No Safari suits for Riley this evening, but from the minute ‘A Friend Like You’ starts, it’s like being greeted by an old friend, someone you’ve grown up with, and who is starting to seem to happy in themselves. It opens their first album, Young Forever, and I think, virtually every gig I have ever seen them play. Their new album, Do Whatever Turns You On, grows on playing. Back at home typing this up, and listening to the album, I realise just how these songs are starting to worm my way into my consciousness (maybe they just need time, rather than more singles off the album). ‘If-Then’ and ‘1970s’ certainly rate with the best songs on their debut. Yet, it’s also so good to hear ‘Surly Girl’ and debut single ‘Vegetarian Restaurant’ again. The backing vocals from Sarah and Ruth on ‘Surly’ could melt the hardest heart, no matter how many times I hear it. Vegetarian Restaurant is actually about Susie’s Diner in Edinburgh. Maybe edinburgh will one day have it’s own rock’n’roll tour and a plaque outside (then again, I remember thinking the Dublin one seemed to be clutching at straws, so perhaps not). Four songs from the new album ‘Poetry,’ ‘All True Trendies’ ‘Whatever turns you on’ and ‘Uptight’ are played in succession, and you start to feel that it doesn’t matter if they’re not interspersed with songs off the debut, you want to hear these new ones too. The chemistry between the band still seems strong, with Murray looking like he’s been the drummer here forever, and Ken looking pretty content with himself too. The band finish the set with ‘love is an arrow’ and remind us that it was their big hit, reaching no.60 last year. If there is justice, this will be surpassed soon enough. They come on for an encore of Devo’s ‘Beautiful World’ which goes seemlessly into ‘Heliopolis by night.’ And as ever, we all do the radio ga-ga hand-claps. The feldys continue to grow and delight. Let’s hope more records come, whether they’re out in Scotland or Mexico. My friends go off into the night, promising to buy the Cds and saying they want to see them again. You will be held to this, guys. OK – I’m sure you probably knew this but next week sees the release of another Damon Albarn-related project The Good The Bad And The Queen. Of course, this time round, his collaborators are none other than bassist Paul Simonon from the Clash, guitarist Simon Tong from The Verve and Fela Kuti’s drummer Tony Allen. Truly Damon is a renaissance man – he’s forty next year, so watch out for a whole wealth of articles then that will be considering just how far he’s come since 1990 (why do I get the feeling that this is not going to happen to Noel Gallagher?). It’s hard to judge the project on the basis of just one track, but this is really very good, and let’s face it, with that list of collaborators, there is going to be no shortage of media and indeed public interest. 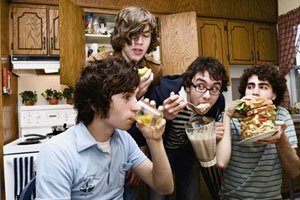 Their myspace page only has the aforementioned tune to stream, but there is a new album to follow in 2007. (Don’t bite my head off Damon, but do I take it that is going to mean no new studio album from Blur or Gorillaz next year then? Er, just wondering). The single is out now to download and will be released on Monday October 30 in the UK on CD and 7″ and deleted that day, so act quickly. Oxford Collapse‘s track Please Visit Your National Parks is the mp3 of the week at the mighty Subpop. Rather taken with its quirky charms, I thought I would post a link to it here, and also include the video which appears below. Something happening in Brooklyn, though I’m guessing all the sheep sheering didn’t take place there… Oh, and anybody think the title is rather reminiscent of Grandaddy (RIP)? Ever had the feeling that the best nights of your life are the ones that weren’t really planned? That’s kind of how it was for this night. Luke Haines, he of Auteurs and Black Box Recorder fame, launching his new solo album Off My Rocker At The Art School Bop. I read about the gig on the train in to London, and convinced my brother he had to come. He needed no second telling. Support came from the fabulous Vinny Peculiar. Managed by Bonehead (yes, he of Oasis fame, the man is a gent), they truly are fabulous. Having not heard their songs before, I was won over, as were the crowd. The singer, Vinny Peculiar himself, just clearly is one of the best singer-songwriters out there right now (if you are having to put your hand up like I was, check the link below. I’m making up for lost time). These are songs that make you laugh – yup, Mr. Zappa, there is room for humour in music, but also think. Check their myspace page,The Everlasting Teenage Bedroom and Jesus Stole My Girlfriend need to be heard. Now. Oh, and the band also include Mike Joyce and Craig Gannon from The Smiths. What are you waiting for? In 1993, The Auteurs’ debut album New Wave suggested that in Luke Haines, here was someone who should be up there as one of England’s greatest lyricists. If Morrissey reminds me of Alan Bennett, then Luke Haines reminds me of Alfred Hitchcock’s British films (think Dial M For Murder, Frenzy, and both versions of The Man Who Knew Too Much.) This evening, backed on bass and drums, Haines demonstrated that he is truly unique and necessary. Whilst some artists seem to hark back to a supposedly wonderful past, Haines reminds us that things weren’t perfect either. His is a black sense of humour – I can’t imagine the Arctic Monkeys writing a song like Unsolved Child Murder, or The Mitford Sisters. Yet new songs like Leeds United remind us that he can make singalong songs out of the most unlikely themes (even when they seem as bleak as Elvis Costello’s I Want You). He knows his stagecraft too ‘I felt like Freddie Mercury at Live Aid’ he quips at one point. He understands just how dark popular culture can be behind the scenes – Bad Reputation points out how revelations about Gary Glitter’s private life have destroyed not only his reputation but also overshadowed childhood memories. He finishes his first part of the set with the Rubettes, and it’s still just as dark, but ever more poignant than it was in 1999. ‘Weren’t the nineties great?’ When he returns for the encore and asks what songs we want to hear, no-one’s yelling for the Richard x remix of the latest single, but there’s so many songs we might want to hear -Showgirl, Junk Shop Clothes, Chinese Bakery, Lenny Valentino…but Baader Meinhof and Future Generation more than hit the spot. In 2000, as part of Black Box Recorder, Haines was on Top of the Pops performing Facts of Life. That show has long since gone, but Haines is still with us, a ‘cult act’ if you like, but oh, how his songbook deserves to be in so many more homes. A true original. Like I say, some of the best nights out are the ones that weren’t planned. …a new post is coming very soon. Hello there. First of all, the blog is now three months old, so thank you everyone who has read it and chipped in their bit, and even those who have linked to it. I still am probably not the most savvy with technology – but compared to my first post three months ago, I can now post links to music, include videos and have an idea about how to monitor it all. Anyway, just got back from the cinema where I went with friends to watch the History Boys. Great film, sad in places but a hell of a lot of laughs too. Mystified how people can do a film about life in the 80s without referring to the political situation, but hey…oh, and great soundtrack too. Here are videos to three songs which appear on the soundtrack, out on October 16 in the UK. Enjoy! I really shouldn’t need to contextualise these, and for once, take it at face value. Then go and buy the albums, obviously, and go and see the film. Meanwhile, if you go to Berkeley Place you’ll find an excellent post on Snow Patrol, a band who are starting to go absolutely nuclear state-side. Having seen them play the Liquid Rooms in Edinburgh, it’s quite something to see them with a Top 5 hit in the US. 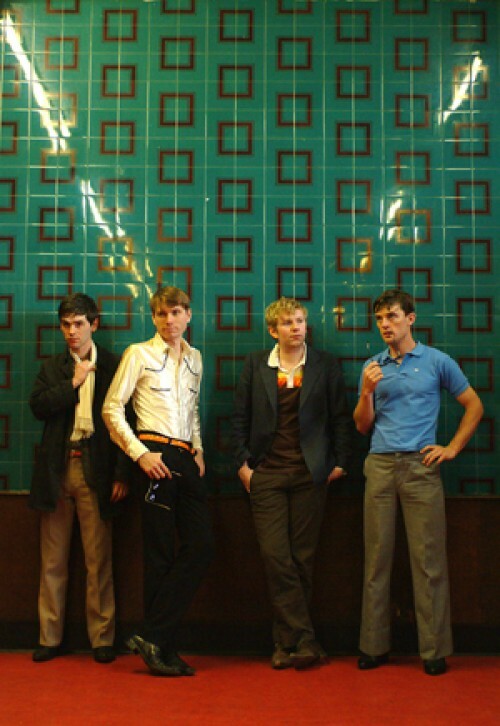 It also mentions Scottish indie supergroup the Reindeer Section, who are co-ordinated by the Patrol’s Gary Lightbody, but also feature members of Belle and Sebastian, Idlewild, V-Twin, and arab strap, amongst others. Finally, another scottish band, up and coming the X-Vectors should be checked out at their myspace page. They make music that suggests an equal awareness of chicago house and scottish indie sounds. They say that they wish they had lived in Chicago in the 1980s or on a space station. I’d love to drop by that station, but for the meantime, go check them out and become friends with them. Well, inbetween trying to plan lessons and getting on with education, I’ve managed to get back to the blog. Finally, The Klaxons are leading the new wave of new rave, or whatever silly label has been applied to it by NME (indie-rave? wasn’t that 1991? anyway…) Whilst it’s too easy to take pot shots at anyone who appears on it’s pages, I who didn’t particularly care for rave the ‘first’ time around (too busy belatedly discovering the Cure and morrissey) think they’ve got something. What think you?